Tennessee quarterback Jarrett Guarantano’s performance Saturday during the Volunteers’ loss to West Virginia may not have been enough for him to keep his job as the team’s main quarterback. The sophomore completed 19 of 25 passes for 172 yards and a touchdown, but Jeremy Pruitt told reporters after the game that Keller Chryst will get snaps next week. Pruitt only made his choice for starting quarterback clear just before the game. 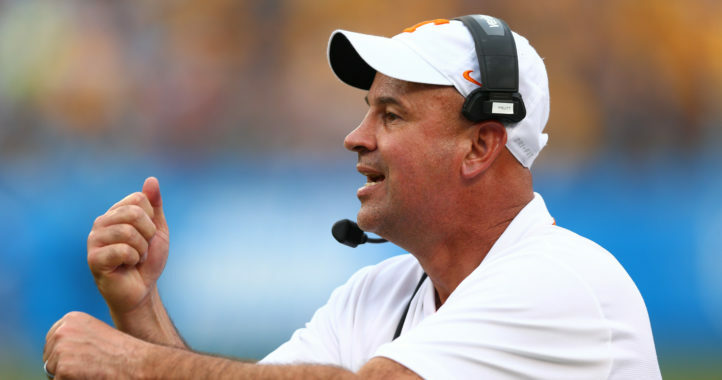 Jeremy Pruitt on Keller Chryst: "We need to play him…we'll let him play some next week." Said he didn't want to pre-determine a scenario for Chryst to play in this game. Also says he thought Guarantano kept his poise today "and tried to play within himself." Pruitt may have given his quarterback a veiled compliment, but he also made it clear that the Stanford transfer would have played next week regardless of what happened. Pruitt says he didn't care if Guarantano went 24-for-24 today, he planned on playing Chryst next week. "We need to play both guys and develop depth." It appears as if Pruitt is open to playing both this season. 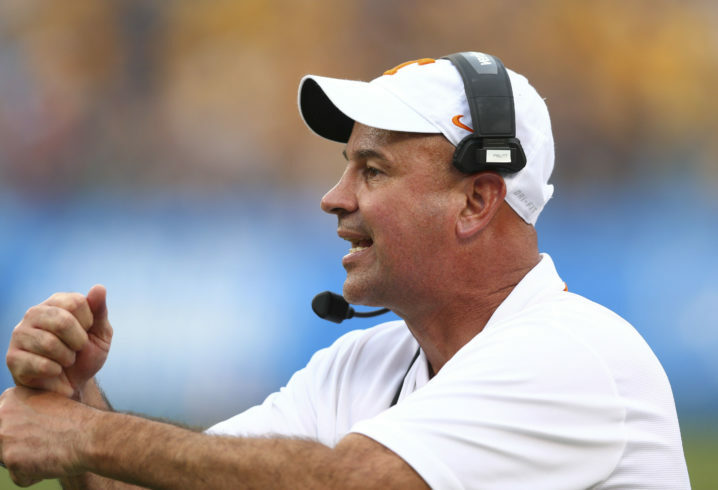 Guarantano provides the experience in Knoxville, but Pruitt has previously said he likes the “wisdom” that Chryst brings. Even if Chryst gets snaps next week, the Volunteers won’t truly know what they have until two weeks later when they get their face their first conference test against Florida on Sept. 22. 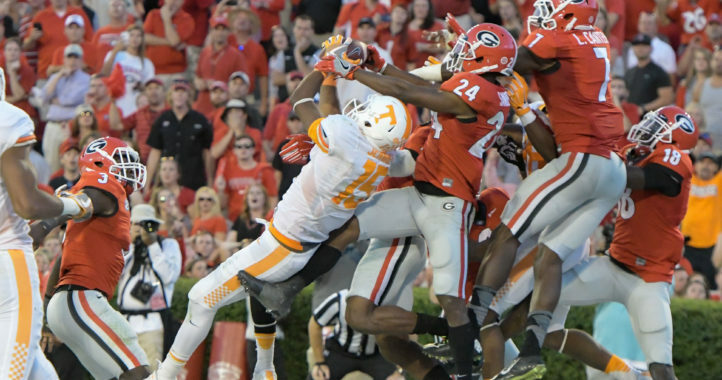 Nick covers SEC football for Saturday Down South. The Vols consider the receiving corps a strength heading into 2019. Why didn’t he play this week? It’s not like JG did much against what has been a pretty mediocre defense. I agree Jarhead, should have given him a series in 2nd half. JG played pretty dang well considering the o-line he has. Give the young man the job. Don’t shake his confidence now. 4 wins is looking shakey as hell right now. Think we are the only SEC team that lost today. Cause we didn’t open with a creampuff! C’mon now, UT lost to a Top 20 (underranked?) team yesterday on the road. Look at the game from a non-shaded viewpoint. “Just the facts, ma’am.” I agree, UT has lots of areas to fix/recruit. But give WVU credit, they can score! G played pretty good but nothing wrong with giving a QB like chryst a shot. You never know when a change can create a spark. G isn’t good enough yet to get mad about it. If you’re happy with your QB being pretty good then you have already lost. Pretty good isn’t good enough. The transfer center from bama hurt usxestly but the seemed to settle down a bit. Trey and chance need to play themselves into game shape. Secondary was as scary as I was afraid they would be. With all the QB talent in the sec Pruitt has to figure a way to at least make this group NOT a liability. I spoke with several folks who all asked the same question…Why does G stand in the pocket and get leveled time aftre time?? Is he to slow to scramble a bit. Can he not run for a few yards like Dobbs did when he has no one open and the pocket starts collapsing? He appears to be fast enough. Why stand there and take hit after hit? MOVE…RUN..SCRAMBLE…whatever, just stop standing there like your feet are nailed to the ground! !